Christmas lights filled Flanagan Way and floats rolled down the street for the town’s annual Holiday Bazaar and tree lighting last Saturday. Residents enjoyed a full day of food, crafts, music, and fireworks. Resident Nate, 8, said he’s been here last year. “I liked everything this year a lot. It’s cool,” Nate said. “I want a Darth Maul mask for Christmas.” Darth Maul is a villain from the Star Wars series. Residents took pictures with Santa and made decorations. Then, participants headed near Huber Street School to start the parade. Fire trucks, trailers, boats and more were coated in Christmas lights, wreaths, and signs that read Season’s Greetings. 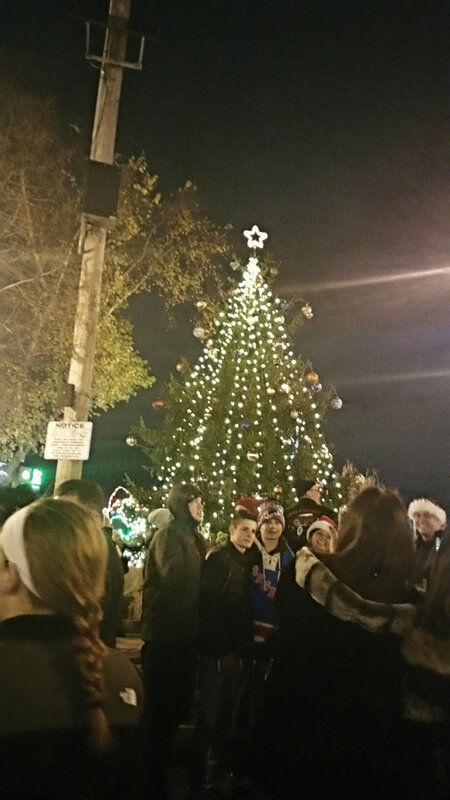 The parade ended at Flanagan Way, where residents waited for the tree to be lit. Members from the Fire Department handed out free hot chocolate for everyone, and People to People gave out free chocolate chip cookies. Children made Christmas ornaments, paper gingerbread men, snowmen, and snowflakes. “I want Animal Crossing for Christmas,” Sakatas said. Animal Crossing is a video game for a Nintendo DS, which Sakatas said she already has. The petting zoo was a popular stop at the lighting. “I want to see the sheep, but I want to pet all of them,” Sakatas said. When the tree was lit, Mayor Michael Gonnelli and the Town Council came out with Mickey and Minnie Mouse, Snoopy, and Mr. and Mrs. Claus to wish everyone a happy holiday. They told everyone to turn around, and to some residents’ surprise, the firework show began. Samantha Meyers can be reached at samantham@hudsonreporter.com .